Announced several hours ago by Microsoft, the Lumia 950 and Lumia 950 XL will be the world's first smartphones to run Windows 10 out of the box. While Microsoft said that both new Lumias would be available starting November, it didn't reveal specific launch details. 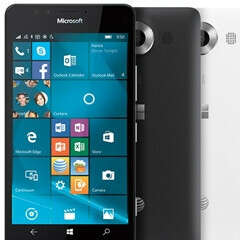 However, AT&T just confirmed that it's going to carry one of the new Window-based handsets: the Lumia 950. As you may have already heard and seen, the Lumia 950 is smaller than the Lumia 950 XL, sporting a 5.2-inch AMOLED display with 1440 x 2560 pixels (Quad HD). It also has a smaller battery (3000 mAh instead of 3340 mAh), and a six-core Snapdragon 808 chipset instead of the octa-core Snapdragon 810 that's found inside the Lumia 950 XL. Apart from these differences, though, the two devices offer the same features, including iris scanners, 20 MP PureView rear cameras, 5 MP front-facing cameras, 3 GB of RAM, and 32 GB of expandable internal memory. You can check out all the important features of the Lumia 950 and Lumia 950 XL here. For now, AT&T can't say exactly when its Lumia 950 will be available to purchase, and neither for what price. However, we know that Microsoft will sell the 950 for $549 off contract. So, any buyers? I'm Tempted To Get One Just To Play With Wp10. for that purpose, you can have a Lumia 550. More pocket friendly and 1/4th of the Lumia 950 price, running LTE. Yeah But I Want That Flagship Experience Tho. With Windows devices all give you a flagship experience unlike Android $50 feels like $50 while $600 feels premium. Windows 10 Mobile is no exception I am running a Lumia 635, 640 XL and 930. All feels the same but features, specs and performance all slightly differ. does it have changeable battery? Replaceable battery 3340mAh on XL there is missing stylus other than that its best phablet now on the market. Best?? They're many phones with similar specs. And Windows is still behind on app support. So in order for it to be the best the whole package has to deliver and its not. well, depends, i dont play games and dont use useless apps, i need perfect flawless email client, calendar, and search engine + assistant sometimes. ms offers full office + outlook, + i prefer cortana over siri and google now, so as productivity i believe they nailed it, other apps will come believe me. plus compare prices..
Because apps rule the word, right? It's no longer 2010 when that joke was credible, it is 2015 and this phone has features others could only dream of, remember that it's not always about the apps but what the phone can actually do. This phone was obviously intended for productivity purposes and deliver high end features no other OEM has. If your main concern is apps then you're in the wrong website. Apps Aside You're Still Right About It Not Being The Best. AT&T is the exclusive carrier for both phones. That's already been established. For a company already struggling in mobile, this is the dumbest possible decision they could've made. Hard to believe! Verizon is a terrible partner to Microsoft, that's for sure. But Verizon's customers don't deserve to lose out. MS could at least make the unlocked version compatible with Verizon's bands, but we'll wait to see if that's true. The unlocked version will likely be only GSM as the vast majority of the world doesn't use Verizon's old CDMA tech. From what we know so far, AT&T is the exclusive U.S. carrier for the 950, but the 950 XL is unlocked and non-exclusive. They are selling them at the microsoft store, I'm back with t-mobile and will be picking one up. Where is IMichael?! dont cry iphone and apple are still the best for you :) guys i had lumia 930 for like 3-4 months, used it just for win 10 experience, well, few bugs like preview build, other than that looks really cool, they just need to get more apps, useful apps not like apple 10 000 000 000 useless apps, just for numbers, but really some nice apps we use and then there is win win for microsoft. i was really amazed about microsoft event, i am using mac book pro now, considering to sell it, at least there is one good thing about apple devices prices are dropping on used apple stuff really slow, i am probably getting that surface book. If att is only carrying the 950 I may bite on it for some wp10 love. Id much rather have any device running Windows 8.1 or Windows 10 Mobile (Unlocked) AT&T tends to add lots of bloat apps and removes the hotspot feature. Rumor floating around right now: AT&T gets the Lumia 950 exclusively, 950XL available unlocked through Microsoft. For the U.S. of course. I can only hope that an unlocked 950 XL would work on Verizon. If not, then I will momentarily marvel at Microsoft's continued marketing stupidity and switch to Android on a Note 5. Wow, on the same day its released they have a carrier to go with? Come on Sony, if Microsoft can get their phone on a carrier, what is stopping you??? Just took a look at the official specs for the 950XL unlocked on Microsoft's website. Only has support for GSM networks. No CDMA support whatsoever. What a joke. C'mon Microsoft, it's 2015. When Apple, Samsung, and even Google can make their phones carrier-agnostic, you have no good reason not to.